Elaine Thompson/APMicrosoft CEO Satya Nadella at an event in January demonstrating new features of Windows 10 at the company's headquarters in Redmond, Wash.
We're now just weeks away from what may be Microsoft's (MSFT) last chance to breathe new life into its fledgling operating system. Windows 10 will roll out on July 29, and it won't come cheap. Pricing has been set at $119 for the Windows 10 Home version with the higher-end Windows 10 Pro slapped with a price tag of $199. That's a lot of money to shell out for a PC operating system, but there's also a good chance that you won't have to pay anything at all. 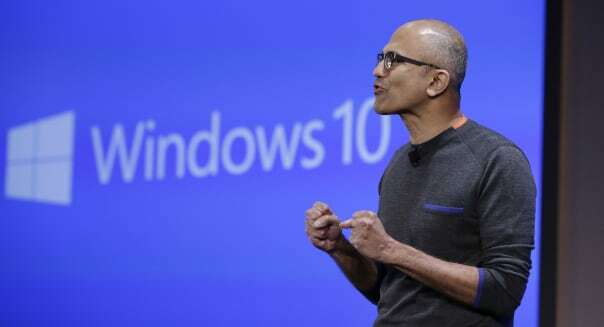 Microsoft has been humbled in recent years after coping with the sluggish PC market and failing to be as popular as Android and iOS in mobile computing. It knows that it will have to be generous in getting consumers to embrace Windows 10, and there will be a couple of ways to grab a complimentary copy. You just need to know what to do -- and by when to act. Microsoft has said that if you already have a legal version of Windows 7 or Windows 8, the upgrade to Windows 10 will be free for the first year. It's not clear what will happen to Windows 7 and Windows 8 users who wait until next summer to upgrade, so it's probably a good idea to take the software giant up on its standing offer and upgrade sooner rather than later. The more intriguing way to score Windows 10 is to join Microsoft's Windows Insider group. This is essentially a glorified beta-testing group, but the treat for dealing with any hiccups that Windows 10 may have in its pre-release form is that it also includes a free copy of the final build. Microsoft posted last week that members of the Windows Insider program will receive Windows 10 activated, genuine and updated forever. However, as Ars Technica points out, Microsoft updated that blog entry over the weekend, eliminating the wording about perpetual activation. All that the program offers now is the final release build of Windows 10. However, that's another way to score a free copy of the new PC operating system, and going the Windows Insider route doesn't require ownership of legal versions of Windows 7 or Windows 8. There's naturally plenty of skepticism surrounding Microsoft's motives. Does cutting off complimentary Windows 7 and Windows 8 upgrades by July of next year -- and tweaking its Windows Insider program blog that promised activation into perpetuity -- mean that Windows is about to follow Microsoft Office into the realm of subscription-based software? This seems unlikely, but it's something that bears watching. For now it's clear that Microsoft is going out of its way to get as many people to embrace Windows 10 as quickly as possible. It wants a large audience to enjoy its Cortana digital voice-activated assistant and the more seamless return of the Start menu. It's giving it away for those who act fast, and that's as good a reason as any to have high hopes for Microsoft's upcoming operating system. Motley Fool contributor Rick Munarriz has no position in any stocks mentioned. The Motley Fool has no position in any of the stocks mentioned. Try any of our Foolish newsletter services free for 30 days. Check out our free report on one great stock to buy for 2015 and beyond.